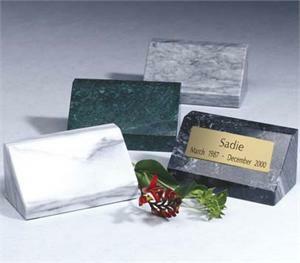 A variety of types and colors of marble* are available on this desktop version of a large marker. Engraving plate and engraving of name and dates is included. Memory easel is offered in your choice of black, white, green or grey. *Due to the nature of marble, color and patterns will vary. What is your brass plate preference? What type style would you like?